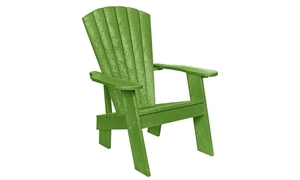 Find your happy place every day with this durable Adirondack chair. Crafted in Canada, its heavy-gauge plastic lumber is made from 95% recycled materials and finished with a wood grain, helping this piece resist rotting and splintering after seasons of use. Marine-grade stainless steel hardware lends lasting strength to this chair, weighing in at 58 pounds so you won’t have to worry about the wind carrying it away. Thanks to its UV-stabilized color, this turquoise Adirondack chair will look vibrant and bright for years to come.